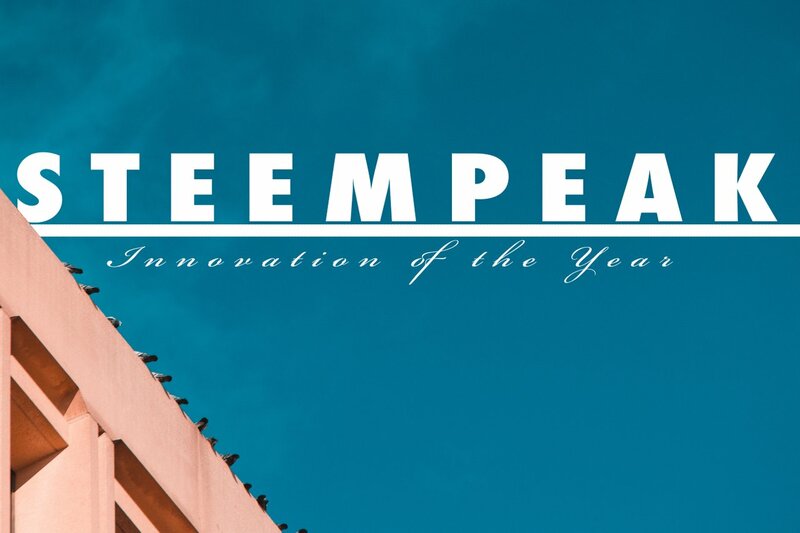 We want to give out our "Photofeed's Innovation of the Year Award" to @steempeak. 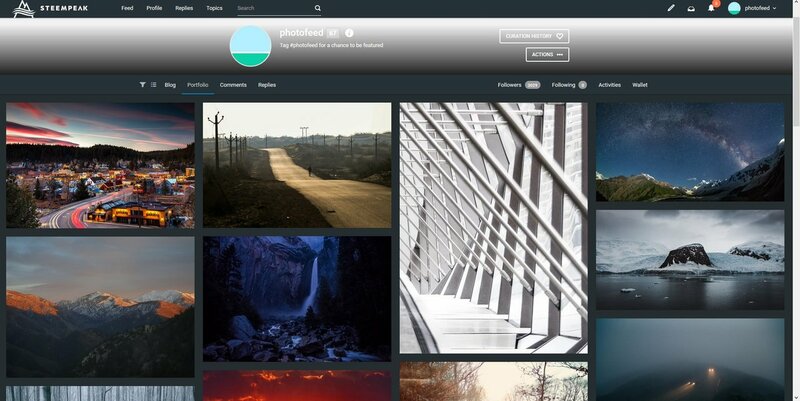 Steempeak has revolutioned Steemit for us, as both photographers and founders/runners of @photofeed. Period. 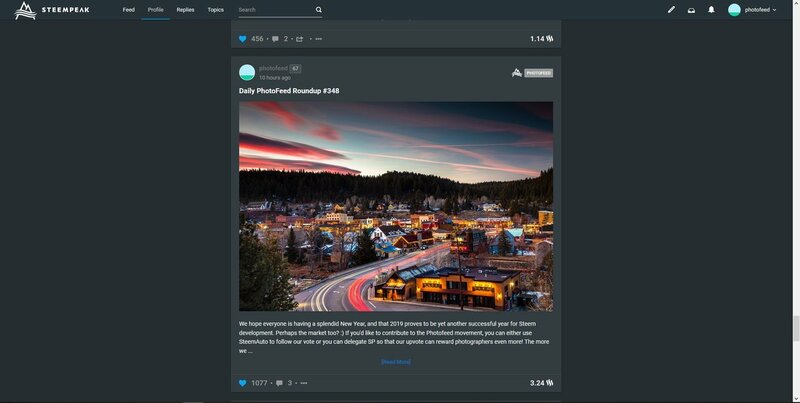 When I (@aweber) go on Steemit.com, I am reminded of how much better Steempeak.com has made the Steem universe, especially for photographers. A small team of developers and marketers (shoutout to @jarvie, @asgarth, @r00sj3 and @dmytrokorol) saw the issues with Steemit and made a front-end of their own, thus resulting in Steempeak. Why is Steempeak so much better for photography? First off, it just caters to visual media so much better than Steemit does. Look at this. Better yet? Steempeak offers a "portfolio" view (go to settings to toggle). Just check out @jarvie's along with our portfolio below. That's just purely the visual stuff. 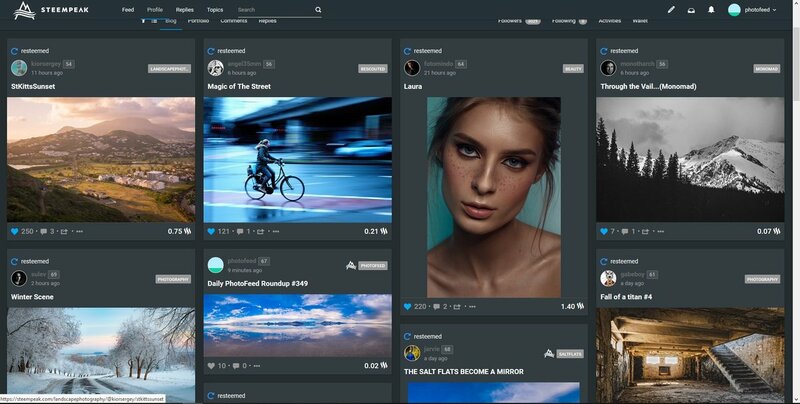 For brevity's sake, we won't delve into all the features of Steempeak, just the ones that cater to photographers. If you wish to view a layout where you can read a bit more about the posts, no need to actually go to a new page now! Once out of the "grid" viewing mode, Steempeak offers a "read more" option that automatically extends the blog onto the current webpage! Talk about convenience! Another amazing thing about Steempeak is the addition of BENEFICIARIES. This has saved the @photofeed team tons of time paying out photographers, since now we don't have to pay artists a week later while doing equations making sure everyone is getting their fair share. It used to be a task none of us wanted to do, but now we can easily give 17 percent to each photographer featured in the daily round-up when making the post and then we are done with it. This has also come in handy for me personally (@aweber) when either borrowing camera equipment or taking a picture of a fellow steemian. Just give them a portion of the proceeds right then and there, and you're all set. That's one of my favorite additions. Another thing we love is for others to be able to see our curation trail, along with adding their vote to it. This way, if you wish to power @photofeed's vote a little more you can follow our voting trail quite easily. 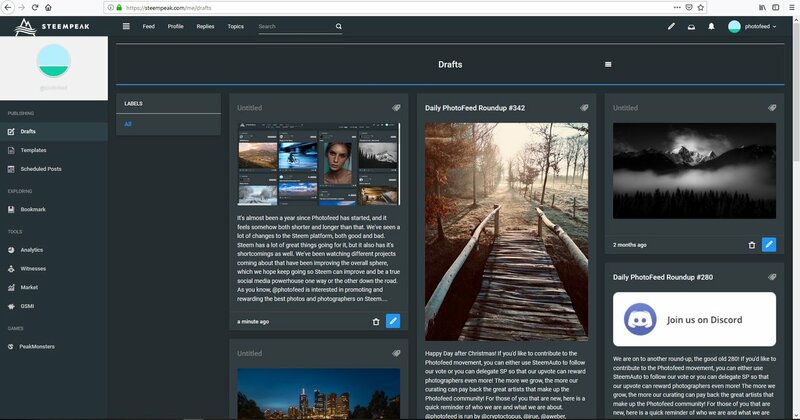 Ok. Get ready...Steempeak offers drafts, templates, and scheduled posts. In writing this post, I wrote it a bit earlier than our 365 anniversary, but just left it in our drafts until now. No fear of losing it, Steempeak automatically backs it up just in case something happens. So nice. Their implementation of templates has been incredibly time-saving for us, and scheduled posts have been very useful (especially for my personal account, so I can set up a few posts to release over the next few days). 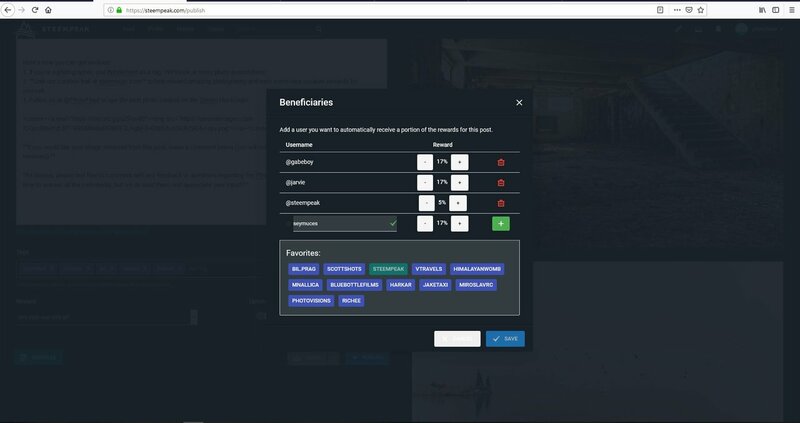 We haven't even covered the analytics, the GSMI, bookmarks, vote value display, text editor and many other intuitive changes. There are a ton more things that we love about Steempeak, but we will let you explore the front-end, if you haven't yet. Follow their page (@steempeak) for updates and tips, and if you feel so inclined add Steempeak as a beneficiary for your posts to help pay the costs of operating the page. Even a percent or five helps, I'm sure. What do you think? Do you agree? Disagree? Let us hear your thoughts! Steempeak (well ok photofeed as well) has literally kept me on the steem blockchain; I would likely have moved on otherwise. Can't say enough good things about the product and the team behind it. @cam.mcfarlane had never heard of it ! Steempeak .com has made the steem universe better,especially for photographers. Damn! I had no idea! I've been using Busy pretty much since I joined just over a year ago. Steempeak is amazing though. How did I not find it till now?! Jeez. Congrats on one year, you guys! You're amazing for sticking to it and doing such a great job!! Busy is definitely a big improvement to Steemit, no doubt. My preference is using Steempeak, especially for photos. And thanks for the support! Literally never heard of it, keen to jump in and check it out! It is such a big step up. Your UA account score is currently 4.999 which ranks you at #1108 across all Steem accounts. Your rank has improved 46 places in the last three days (old rank 1154). In our last Algorithmic Curation Round, consisting of 364 contributions, your post is ranked at #49. I really love @steempeak: togheter with @partiko, it change my ecosystem perception! Please help me to create an account using rc from the Steem Peak website tool. Please allow me to claim the right to rs create account. Do you have access to code? The process using python is safe and well explained here.